Nominating committee and in 1967 attended the National Assembly of the organization at Purdue. (Mrs. Florence Eggers) Very closely tied to Church Women United has been her very active support of the Delta Ministry of the Council of Churches of Scott and Rock Island Counties. She initiated a series of Ice Cream Lawn Socials hosted by various churches in the Quad-City community community for the past several years. Those working in the Mississippi Delta region benefiting from these fund-raising projects have been the Rev. Rims Barber and Miss Sue Geiger and of course, the countless others with whom they have worked. 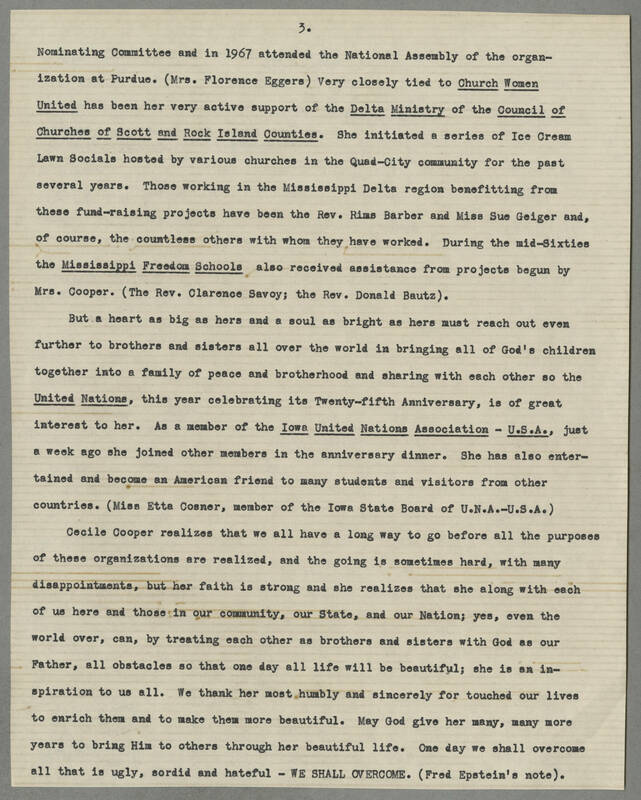 During the mid-Sixties the Mississippi Freedom Schools also received assistance from projects begun by Mrs. Cooper. (The Rev. Clarence Savoy; the Rev. Donald Bautz). But a heart as big as hers and a soul as bright as hers must reach out even further to brothers and sisters all over the world in bringing all of gods children together into a family of peace and brotherhood and sharing with each other so the United Nations, This year celebrating its Twenty-Fifth Anniversary, is of great interest other. As a member of the Iowa United Nations Association- U.S.A, just a week ago she joined other members in the anniversary dinner. She has also entertained and become an american friend to many students and visitors from other countries. (Miss Etta Cosner, member of the Iowa State board of U.N.A-U.S.A.) Cecile Cooper realizes that we all have a long way to go before all the purposes of these organizations are realized, and the going is sometimes hard, with many disappointments, but her faith is strong and she realizes that she along with each of us here and those in our community, our State, and our Nation; yes, even the world over, can, by treating each other as brothers and sisters with God as our father, all obstacles so that one day all life will be beautiful; she is an inspiration to us all. We thank her most humbly and sincerely for touched our lives to enrich them and to make them more beautiful. May god give her many, many more years to bring Him to others through her beautiful life. One day we shall overcome all that is ugly, sordid and hateful - WE SHALL OVERCOME. (Fred Epstein's note).